My mind was swirling with the crashing waves. I was unable to let go of the images I witnessed yesterday when we visited Patar’s Rock Formation. My mind’s eye was churning infinite and exquisite possibilities of how those craggy coral stones and low lying natural sea platforms would look with the angry waves during the golden hour. But the only way I can make these hazy images become a clear possibility is for me to stay another day in Bolinao. That meant I have to say goodbye to my travel buddies as they head back to Manila and it also meant that I have to find myself a decent lodging; cross decent, an affordable lodging near the rock formations where I can spend the night without me having to thumb my way back to the metro. 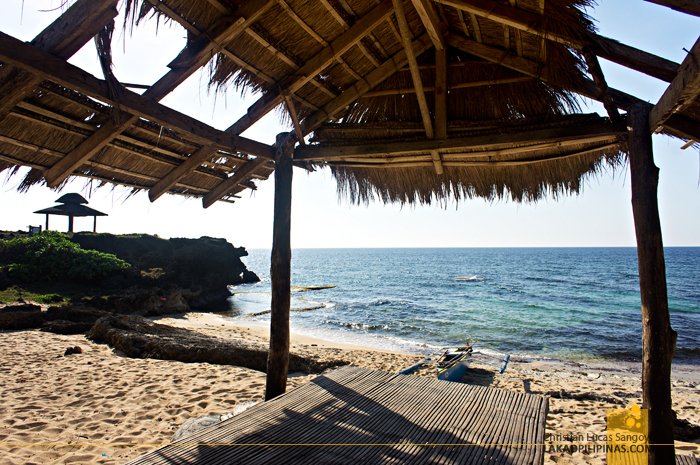 Google Maps became my instant friend as I navigated Patar’s coastline through my mobile and found Rock View Cottages. Having absolutely no idea how much their nightly rates were, I bade goodbye to my buddies, tried to forget the comfort of Puerto del Sol, slung my heavy backpack and hit the dusty road. I felt like taking a gamble. 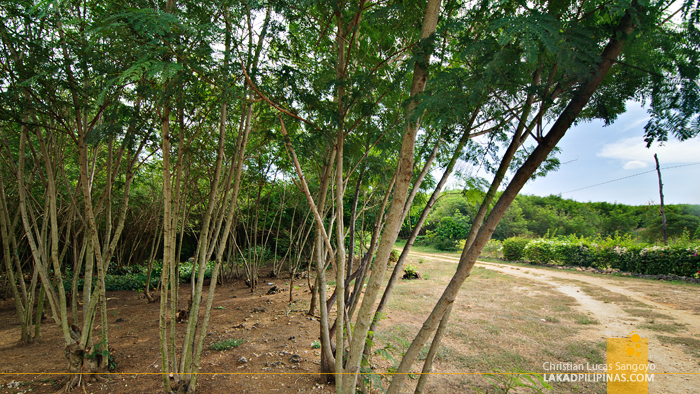 A boulevard of white sand and midsized trees guided me as I alighted from the tricycle I rented to Rock View. It sucked that I didn’t have loose change for the fare and I ended up giving a few bucks more than needed since the driver also didn’t have change for my bills. Every cent counts on unscheduled trip extensions. Rock View has a total of seven closed wooden huts that can accommodate up to five people each (or more actually, if you want to, they don’t have any limit on the guests allowed per hut) and four open cottages that are good for day trippers. 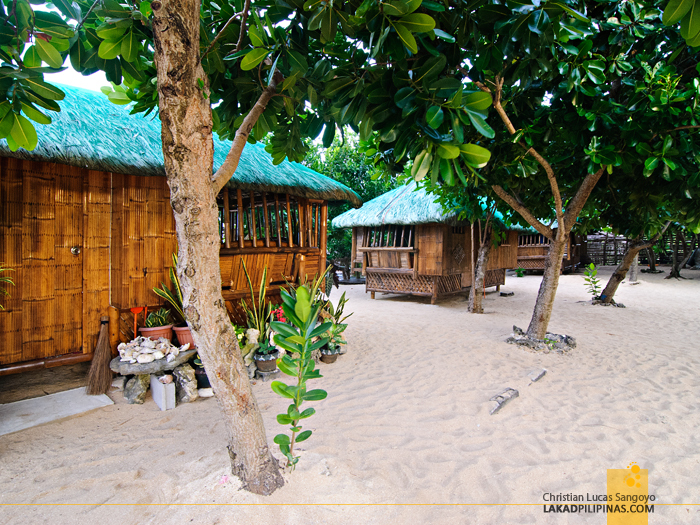 The closed huts range from Php2,500.00 during lean months and Php3,000.00 to Php4,000.00 during peak seasons. 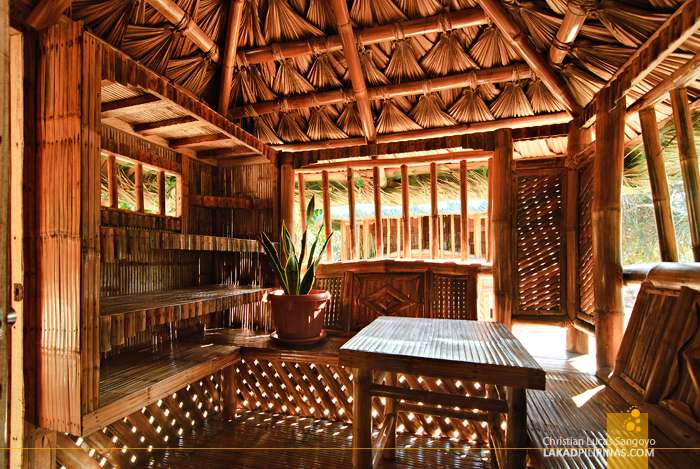 The open cottages on the other hand range from Php300.00 to Php500.00. It’s actually not bad especially if you’re in a big group. 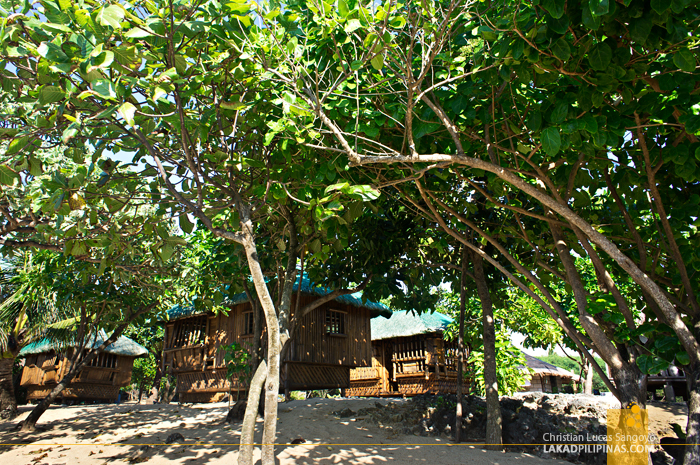 I reckon one can easily cram these huts with eight individuals which would easily lower your nightly accommodations to around Php300.00++ per person. But still, it was too expensive for an individual with no one to cut the expenses with, so I tried to reason and haggle with the resort owner if they can lower the rent. They asked me how much, I named my price and they easily relented; God bless your kind hearts ma’am and sir! 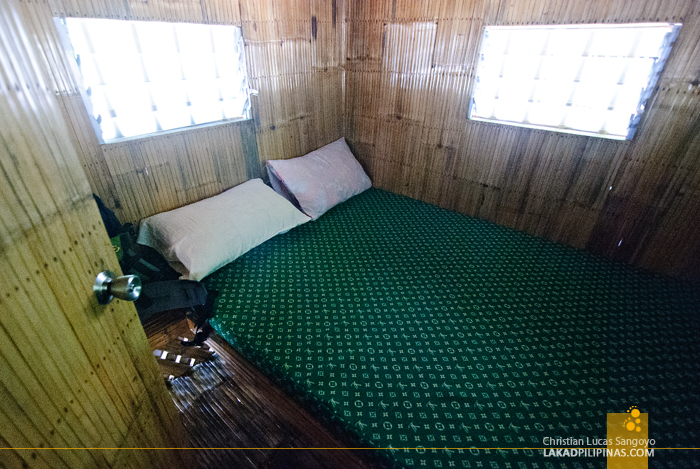 The huts have a separate open-aired living area and a closed bedroom with a queen-sized bed. The room is fan-cooled but I hardly used the fan since it was so freakin’ cold at night, the resort being super close to the sea. The toilet and bath is located a few steps away from the hut, which is no problem during the day but a real challenge when you have to pee in the middle of the night. I like the fact that the area is surrounded by lush vegetation. I arrived at high noon and I still felt like a cool cucumber under the shades of the low trees. I even managed to order a cup of hot coffee while trying to fit in with my new environment. Chill. A cave with a natural pool is located right in front of the cottages where guests can cool down without feeling the intense heat of the summer sun. I’m just not sure how safe it is to wade inside the cave since the water coming in were from the waves slamming the formation outside. I can imagine a huge wave coming in might leave one with severe bruises from the rock walls of the cave. 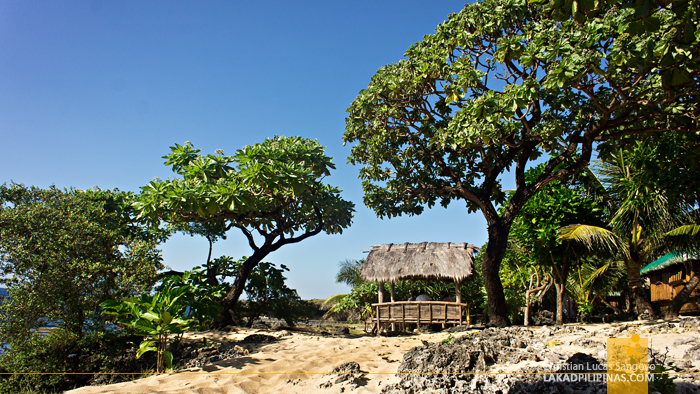 But my favorite spots at Patar’s Rock View Cottages are the open huts sprawled along the beach. Some are in rather bad shape but I really don’t mind; as long as I have a sturdy bench to sit on and put my feet up, a table to set my cameras, the endless sparkling sea on the horizon for my viewing pleasure and a cup or two of steaming hot coffee, then I’m totally good. I’m easy like that. This is a nice resort with great rock formations up front..
DUnno nga lang sa swiming part kung ok maligo.. parang mabato yung beach. Hi Sir Christian! I would like to know more about this place. May I know how to contact you if ever? Thank you! 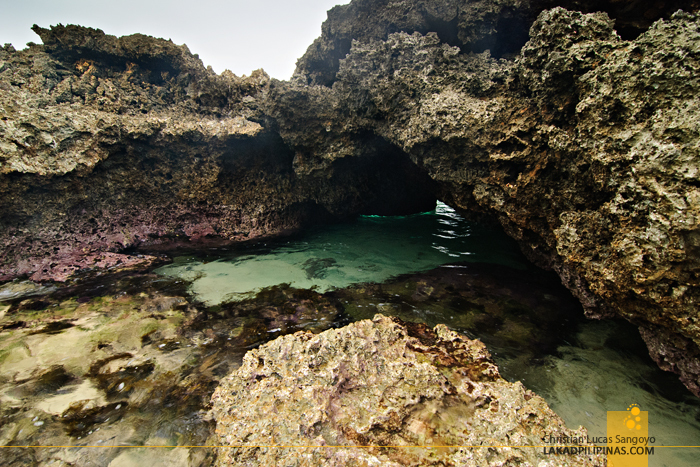 Liked the rock formations of Bolinao by the beach... I think those are what makes their beaches unique. 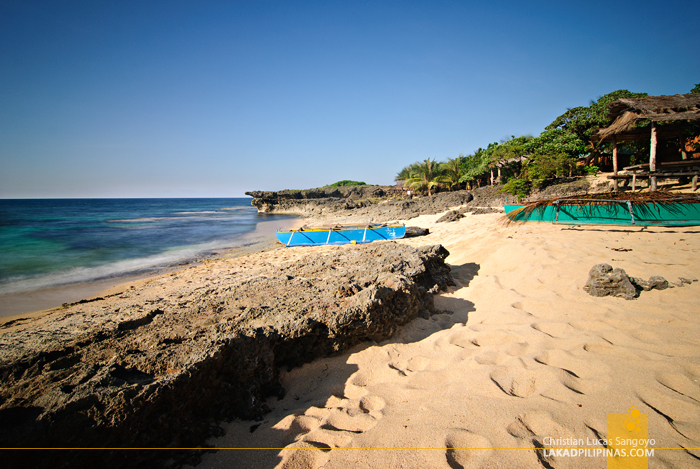 Its like a trademark of Bolinao Beaches. I sounds that you end up haggling with the owner at a lower price that fits your budget. Coffee is our compliment in times when we are on solo travel.:-). do you have any site where we can see prices?? Hi Chris...thanks to share new contact number of rock view..
Hello Chris! How can we get to the resort via private van? Hi! 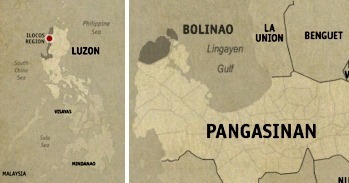 my lutuan po ba sa place nato? Salamat! been here about a month ago...maalon and dagat...gives more character to the resort...tawanan ng tawanan kasi yung nag tatalunan pag dating ng alon...to avoid the waves ...scenic ang view ,mahangin...sarap matulog...sulit ang 6 hours drive thru sctex and tplex.